The 1857 issue of The Golfer’s Manual hits the stands. The Scottish novice golfer leafs through the publication and reads a new recommendation: “The novice golfer is advised to wear stout shoes roughed with small nails or sprigs” while shuffling through the links. In addition to providing safety while simply walking over slippery ground, it provided a non-slip base while swinging the club. Then, in 1891, golf shoes were introduced with separate screw-in spikes that provided even better footing and were much more comfortable than some of the shoes (and even boots) worn by some golfers. Not everyone was happy, however, as groundskeepers begin complaining about greens being damaged. 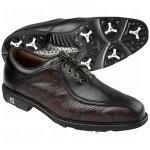 The early 1900s arrive as do the “saddle oxford” style of golf shoe with extra material around the laces and became more of a “standard” look for golf shoes everywhere. 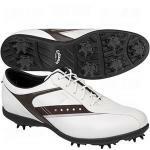 The saddle shoe remains popular until softer, more flexible athletic-style golf shoes begin appearing in the late part of the 20th century. Finally, groundskeepers everywhere are happier as soft spikes are introduced in the 1990s, and even “turf style” shoes become more popular. 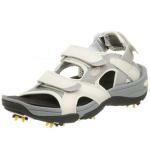 In addition, even advancements of styles such as golf sandals and golf “croc” style shoes become popular as more manufacturers experiment with types. 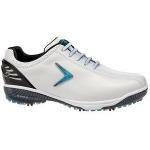 As stated in the history, it is obvious and evident that golf shoes provide a good source of stability while traversing the golf course while ensuring the golfer maintains a solid base and stance while swinging. Through the shifting of weight and twisting of the body and hips, the feet should remain firmly planted and not slip while performing the stroke. In addition, the most effective golf shoes also provide protection from moisture while the golfer treks over eighteen holes of grass that is occasionally wet. The best way to choose a golf shoe is literally the same as picking out any other shoe: trying them on and seeing how they feel. The most important deciding factor about choosing your golf shoe is if they are comfortable to wear for long periods of time. For example, one of the most comfortable men’s shoes you can purchase is the Etonic GSOK. For women, the Adidas Tour 360s are highly recommended. If you are a golfer that must consistently play in adverse weather conditions, dewy mornings, or a humid environment, it might behoove you to choose a shoe known for its waterproof nature such as the FootJoy DryJoy brand. Bottom line: try some on. Wear them. Practice a golf swing or two. Make sure they feel good first. Then you can worry if they are stylish enough for you or not. Why do I get the feeling Michael Jordan is behind these Nike Dunks? 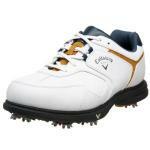 These are not your grandfather’s golf shoes! These shoes come with gems! Callaway has "be-dazzled" the shoe with genuine Swarovski crystals down the side… Oooooooooh! By the way, what are Swarovski crystals? And when did Paris Hilton take up golf? Callaway isn't messing around with these golf shoes. This is a premium shoe designed with high performance in mind and some cool features to keep your foot comfortable and healthy in the process. Let's take a look under the hood. "So ya wanna playya da golffa? You wear-ra da golffa shoe, no? Ahh, I gotta da golffa shoe for you!" 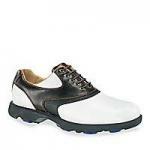 If you are a fan of Crocs, then you will love these golf shoes. Crocs, of course, are those ugly shoe sandal things that are built for comfort. You see the laid-back outdoorsy folks, hippies, and a few hip doctors sporting ‘em. These shoes get their name from their ability to flip crazy "backside Ollies." Hold on, that's not right. This isn't "ZipSkateboarder.com." This shoe scores above average on my big three when it comes to a golf shoe: Performance, Comfort, and Style. Throw in a relatively good price for a high performance golf shoe, and you have a keeper. And you thought you were the biggest golf dork on the block already. Nope, not until you go out and fetch the morning paper sporting these bad boys. 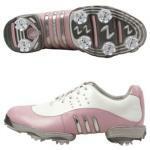 They are golf shoes for your bedroom. "Fore!" 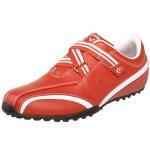 This Etonic Men's GSOK golf shoe is very popular because it is so comfortable. The secret is in the patented "SOK" which conforms to your foot along with the memory foam that hugs the top of your in-step and ankle. The styles are getting wilder in men's golf apparel. Have you seen what John Daly has been wearing lately? 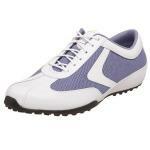 These Casual Cool Ribbon Golf Shoes have a sporty look. They look like running shoes. The same question has been asked throughout the ages: Is there a completely waterproof golf shoe that is also comfortable? Okay, maybe just asked throughout a few ages. These FootJoy Contour series are the most comfortable shoes that I've ever worn. Right out of the box, they feel like they are already broken in. 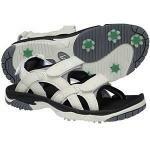 If you have problems with your dogs barking after a round of golf, you will want to give these shoes a try. 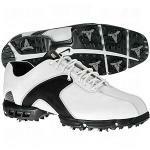 FootJoy's DryJoys shoe has been an extremely successful model for the company. It comes in several different styles — we'll talk about the DryJoy in general first, and then we'll get to some details on the variations. 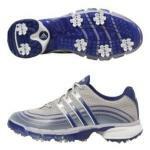 These Adidas Beacon Golf Shoes are some of Adidas' economy golf shoes. You're not paying a lot of money here, and like my grandmother used to say, "You get what you pay for." 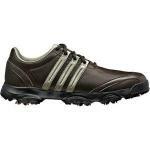 This golf shoe looks like you could run a triathlon in it. It has a mesh looking upper with a very sporty design. Let's look at the technology. 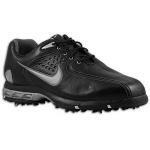 Check out these cool Nike golf shoes. I like the sporty look of these shoes. Let's take a look under the hood. These are some pretty ugly golf shoes, but the price is right! I'm really not feeling the grey stripes on the brown leather. However they do come with some pretty cool technology. Here's a comfortable, inexpensive golf shoe from Nike. 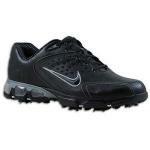 I really like this Nike Air Tour Golf shoe because you are getting a lot of shoe for a low price. Tiger Woods has worn this shoe. No, not this specific shoe -- you get a brand new one -- but this particular model. It has a laser-etched logo on the heel to commemorate Tiger's tenth-year anniversary of his first major. 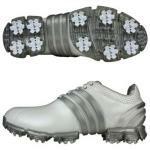 Check out these golf shoes by Adidas that look like they are made out of mesh. Just looking at these shoes it appears that they would be as comfortable as bedroom slipper. Let's take a closer look. 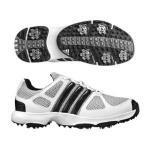 Here are some lightweight economy golf shoes by Adidas. 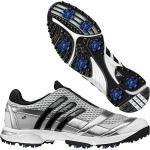 The Men's Tech Response Golf Shoe is a comfortable golf shoe at an affordable price. 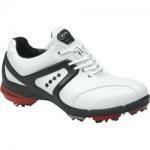 This is a great looking golf shoe. You can get it in all black or all white. It is from Nike's 2009 Air Max line. Check out this ultra comfortable shoe from Adidas. This shoe is so comfortable you could almost go jogging in it. Let's take a closer look. 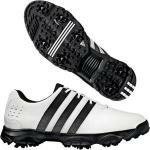 PGA professional Sergio Garcia sports this tour quality high performance shoe. This is the Adidas' baby and their top-of-the-line golf shoe. This bad boy has more cutting-edge technology than the space station. Let's take a look. I'm not a big fan of these golf shoes. Don't get me wrong; FootJoy makes a great product, but these are their scaled-down model. Let's call it the "Economy" FootJoy. 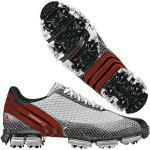 These cool FootJoy SYNR-G golf shoes were designed for golfers looking for stability and motion control. The three main features at work here are the FootJoy's Tri-lateral Stability Frame, Alloy Stability Bridge, and Stinger Cleats. Here's a sturdy golf shoe by Nike. 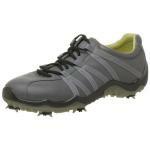 The look of this shoe doesn't knock my socks off, but it is a tour quality shoe that is very durable and waterproof. 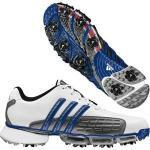 I love the look of these Adidas Powerband 2.0 golf shoes. They look like you could go out and run a marathon in them. They are very sporty looking and have some great technology. 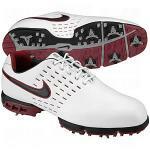 This is a comfortable golf shoe by Nike. Since this is an older model, the Nike Mens Air Tour TW is a great shoe for the price. Let's have a "look-see" at all the great qualities of this shoe. I have been known to like gadgets. It's true. New innovations that make things easier or faster are always interesting to me. When I saw this shoe come up for review, I was excited because I knew it had something different than I had ever seen before.